On Sunday night, the National Geographic Channel kicks off three nights of '80s mania with the first episode of The ‘80s: The Decade That Made Us. In honor of this incredibly rad development, '80s authority Robb Skidmore cooked up some fan fiction starring two charmingly insufferable relics from the Me Decade, the Valley girl and the yuppie, set in a modern-day mall (remember those?). Warning: brick phone cameo ahead. Richard and Val arrived at a shuttered The Limited store in the Sherman Oaks mall at the same time, each holding return items. Only dust and naked mannequins remained inside. "Gag me with a spoon, not The Limited!" Val said. "This is like totally not cool!" Richard took off his Vuarnets, pausing to see if she noticed his luxury eyewear. "This is so major embarrassing. I'm petrified. I'm like totally a tree that's turned to stone and is lying in the desert." "It's the sales rotation. It's all moving online," Richard said smugly. Val studied Richard, in his grey pinstripe suit and shiny wingtips, holding a tragically brown sweater. In his other hand was a combination lock briefcase. "Are you like carrying your whole life in there?" she said, making a snotty face. Richard raised the briefcase defensively, reflecting on how efficiently it transported files home each evening. "This is calfskin of the highest quality." They introduced themselves. Richard took note of Val's coordinated pink shoes, sweater, and hair band, which acted as only a mild organizational force to her voluminous hair. Richard nodded toward Orange Julius. "Let's go drown our troubles. Drinks are on me." "Free drinks are so righteous. I'm there," she said, stuffing her return blouse into a giant acid-washed denim purse. They each ordered a drink and sat at a plastic table. "Brain freeze!" Richard said, gripping his skull. Val slurped her Julius. "You seem, like, very uptight." "During times of unemployment it is important to keep oneself sharp." A high-pitched chirping came from his briefcase and from it he produced a brick phone. "Richard here!" He covered the mouthpiece and whispered, "This is also a weapon of last resort. I could kill someone with this. Try that with a smartphone." When he got off the phone he said, "That was one of my old pals at Lehman Brothers. Wall Street. You may have heard of it." She stared at him with scrutiny. "Well…" He winced. "They kinda went out of business. And, there was this thing that happened, I had nothing to do with this mind you – if only they had listened to me! — this thing, that involved mortgage-backed derivatives, and thousands of people kind of lost their homes." He shrugged and threw his hands up. "Grody. Like who doesn't have a house? I mean without a house you could not even host a prom party!" "Exactly. But you would not believe the insane party me and my colleagues had the last day!" "Then working there was so totally worthwhile!" "Oh, yeah." Richard pulled down his sleeve then pointed at his Rolex. "That is so obviously a fake. I can tell from here." Richard turned red. "That's my story. You seem to have plenty of free time. Why are you here alone?" Val sighed. "Back in the day it actually was bitchin' to come here with all my friends. But now they are such dorks. Most of them are like married now and they have these child responsibilities and like gross shoes. I never see my friends at the mall anymore, and Facebook just isn't a substitute." "Yeah, what does "poke" even mean?" "Yeah, the poke is like whatever. I had to pull back from coming to the mall. I learned a grave and gnarly lesson about credit card debt. Bankruptcy is so totally a bummer." Richard pulled a bag of quarters out of his briefcase. "We are so set for some arcade action!" "I will warn you. I had the Donkey Kong high score for ages." "You're talking to the queen of Frogger. I rule at crossing that busy intersection. You're going to be road kill." They stood, mouths agape, in front of the long-boarded-up arcade. "This is outrageous!" Richard said. "We have to complain to management. What is wrong with this place?" "What is wrong with the world today? When everyone isn't tweeting pictures of cats, they're texting and driving at the same time. Nobody knows how to party anymore! Mix up some daiquiris, play some Duran Duran and like rock it out." "Are we the only people who still understand these things?" "We're not alone. But I'm glad I met you today." Val pointed. "Far out! It's like the last Spencer's in America!" Inside they lost themselves, laughing over cans of Fart Spray and Spanish Fly. They admired black-light posters of wizards and cobras, staring wondrously. Bathed in the otherworldly glow, a single word escaped Richard's lips: "Bitchin.'" 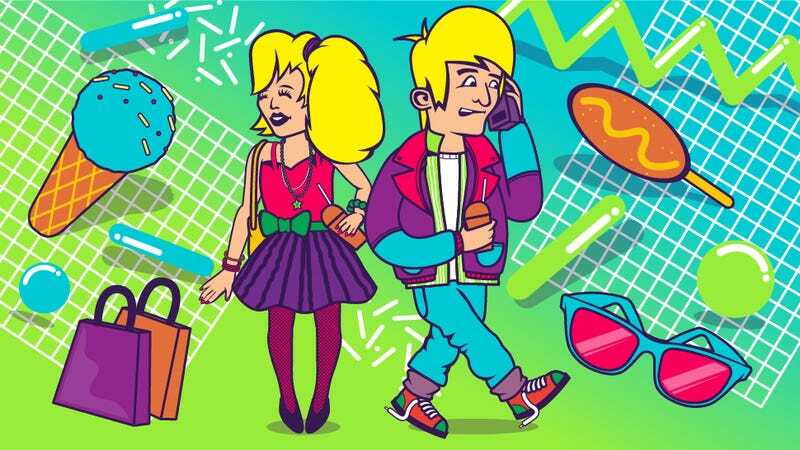 Tune in to the National Geographic Channel tonight at 8 PM to see yuppies flashing their brick phones and other ‘80s wonders that affect us today on night two of their three-night event, The ‘80s: The Decade That Made Us. Robb Skidmore is a novelist and the author of The Pursuit of Cool, an acclaimed novel about love, music and the 1980s.